McCarthyism: In the 1940s and 1950s Americans feared the encroachment of Communism. The Soviet Union was growing in power and the threat of a nuclear holocaust was on the forefront of American minds. Eastern Europe had become a conglomerate of Communist satellite nations. Throw in China and Americans began to feel they were surrounded by a Communist threat. Paranoia ensued. The Crucible: Salem established itself as a religious community in the midst of evil. Salemites considered the forest the domain of the devil. Salem was surrounded by forest. Paranoia ensued. McCarthyism: Joseph McCarthy, U.S. Senator, made unsubstantiated claims that more than 200 "card carrying" members of the Communist party had infiltrated the United States government. He had no proof. The Crucible: Delusional girls make unsubstantiated claims about the existence of witches in Salem. They have no proof. 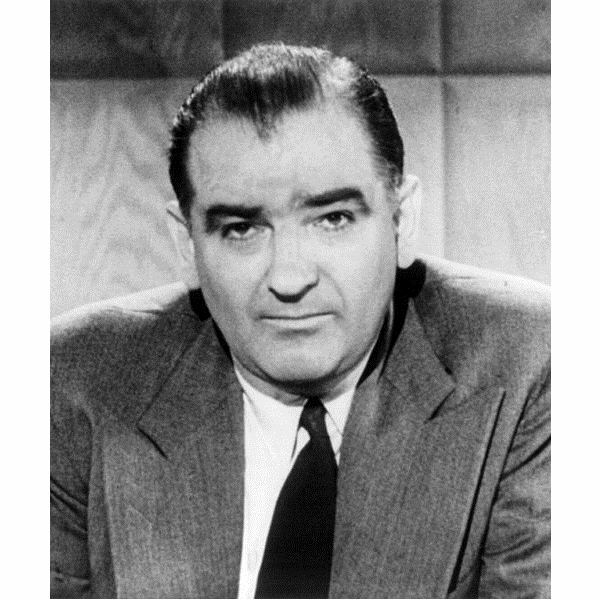 McCarthyism: McCarthy's unsubstantiated claims ruined lives and led to increased hostility. The Crucible: The girls unsubstantiated claims ruin lives and lead to increased hostility in Salem. McCarthyism: Those who were accused were assumed guilty, put on trial, and expected to divulge the names of other Communist sympathizers. Failure to do so led to sanctions. The Crucible: Those who are accused are assumed guilty, put on trial, expected to confess, and expected to accuse others of being witches. Failure to do so leads to death. McCarthyism: The media were not willing to stand up to Senator McCarthy for fear of being accused of being a Communist. The Crucible: Townspeople are not willing to stand up to the court for fear of being accused of being a witch. McCarthyism: Arthur Miller was called before the House Un-American Activities Committee and subsequently blacklisted. The Crucible: Arthur Miller wrote it. To help better understand some of the deeper meanings in The Crucible, below are a list of significant symbols found within the play. The Doll: The doll found on Elizabeth Proctor's shelf is a traditional symbol of voodoo and witchcraft. In The Crucible, the doll (as well as Rebecca Nurse) symbolizes the transformation of good to evil: dolls, in a normal society, represent childhood innocence and bring happiness. In Salem, dolls represent evil. This extends to the Puritan government and church, both being entrusted to protect its citizens, yet both doing the opposite. The Stones: Giles Corey refuses to make an official plea in court. In order to persuade him to make a plea, officials of the court stack concrete stones on him and eventually crush him. The stones symbolize the weight of Salem's sins that are crushing the good in its society. Elizabeth Proctor's Pregnancy: Elizabeth's execution is stalled on account of her pregnancy. This represents hope that the future may be different. The Boiling Cauldron: The controversy begins with Salem girls running wild through the forest around a cauldron of boiling water. This cauldron symbolizes the wildness of the girls, or more specifically, their repressed sexual desire bubbling over. John Proctor's Leaving the Courtroom: This occurs in the movie. After Proctor is accused of witchcraft, he runs into a small pond and with arms spread shouts, "God is dead." Proctor is in water, symbolic of baptism, and his arms are spread, symbolic of the Biblical Christ on the cross. Proctor sacrifices himself for the good of Salem and to honor those saints (Rebecca and Martha) who refuse to lie. The Witch Trials: In addition to the similarities between McCarthyism and The Crucible already discussed, the trials symbolize the effect of intolerance, extremism, and hatred. The Forest: Puritans believed that the forest was the devil's dominion. They failed to recognize, however, that Salem's evil and destruction came from within. The forest, therefore symbolizes the evil present in all humans. Feel free to read this review of The Crucible, which contains critical analysis of the play. Feel free to share your own interpretation of The Crucible in the comments section. If you’re a witch you probably don’t want to read this study guide. You’ll be hanged soon.